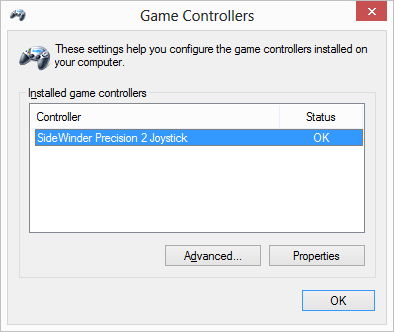 How do I get a Microsoft Sidewinder Precision 2 joystick to work on Windows 8? When I plug it in, Windows 8 doesn't recognize the Microsoft Sidewinder Precision 2 joystick as being plugged in at all and it doesn't work. How do I fix it? I ended up shutting off the computer (actually, just sleeping it, but you could try shutting it off). With the computer off I plugged in the joystick, started it up, and Windows 8 found the joystick, installed the correct drivers, and I was good to go. The accepted answer also works for Windows 7 with Sidewinder joysticks. If Windows sees the device but doesn't recognize it as a game controller, go into the Control Panel and uninstall the driver or the device. Then connect the joystick, restart Windows, and it should work. If it doesn't work, please try an USB port that's directly on the mainboard. The joystick draws quite some power and secondary connected 'front' ports or ports on a hub do not always work. Not the answer you're looking for? Browse other questions tagged windows-8 game-controller peripherals or ask your own question. How do I use key combinations on an axis on a joystick in xorg? How do I map a keyboard as a joystick device in Windows 7? How does windows differentiate between USB keyboard and USB joystick? How do I get an existing Windows 8 installation to recognize a ps/2 keyboard? How do I get my PS4 controller driver to work on a PC?